This week’s community news includes a day of service for Columbus Day, Build-A-Bear donation event and hockey program benefitting disabled kids. Employees from the $180 million St. Cloud Federal Credit Union in St. Cloud, Minn., show off their T-shirts with the organization’s theme for the day: Be Kind, Do Good. The credit union closed its branches on Oct. 8 for Columbus Day to participate in its fourth annual community day of giving designed to make a difference in the community. 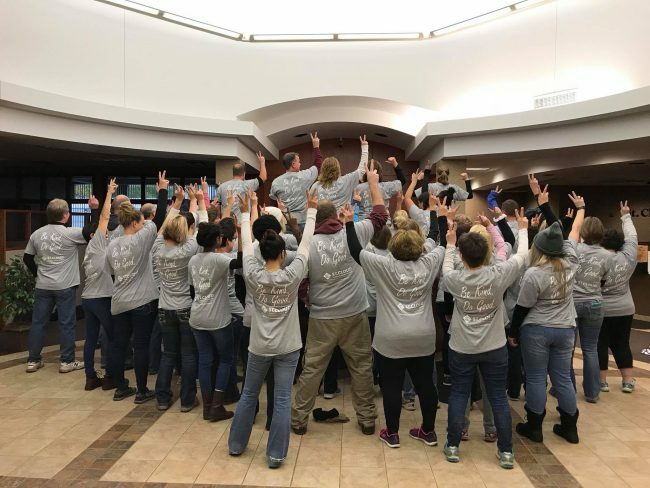 The credit union asked its members and an employee-led team to determine the locations for the organization to donate time. Four local non-profit organizations were selected, of which nearly 60 employees volunteered. All rooted in Central Minnesota, the credit union was proud to give back to a variety of places that make a difference in the community. The organization’s theme for the day played out well with like-minded non-profits that provide services to help people in different ways, ranging from offering hospice services and supporting troops, to helping feed local children and assisting people with their animals.